The wrestling world is buzzing over the arrival of All Elite Wrestling. 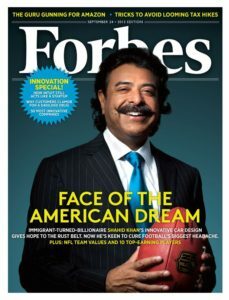 This new promotion was founded by Shahid Khan and his son Tony, and envisioned by Cody Rhodes and Matt and Nick Jackson – the Young Bucks, after the success of the ‘All In’ event in September 2018. ‘All In’ was created by Rhodes and the Jackson brothers in response to a comment that was made by a wrestling journalist named Dave Meltzer who claimed that other than the WWE, no other group in the US could draw a crowd of 10,000 to their event. At the time, Rhodes and the Jackson brothers were members of the Ring of Honor roster and decided to challenge Meltzer’s perception on behalf of their employers and the independent circuit. With assistance from ROH and the use of their own resources, Rhodes and the Jacksons organised a card which included wrestlers, announcers, referees, and other personalities from ROH and other organisations. The challenge resulted with ‘All In’ drawing a sell out crowd of more than 11,000 fans, thus disproving Meltzer’s comment. Months after the ‘All In’ event, the Khan family approached Rhodes and the Bucks with a proposal that would allow them to capitalise on their success and this eventuated into the formation of All Elite Wrestling. Along with Rhodes, and the Young Bucks, several others left ROH in December to be a part of the new venture. The Khan family are not strangers to the sports world. In addition to financially backing All Elite Wrestling, they are the proprietors of the Jacksonville Jaguars from the National Football League (NFL), and the Fulham Football Club from the English Premier League (EPL). In addition to being wrestlers in the company, Rhodes, and the Young Bucks are also Executive Vice Presidents. AEW could potentially fill a void in the US scene which many fans haven’t seen since the ‘Monday Night War’ between WCW and the WWE in the 1990s while others were too young or weren’t born to experience a time when there were two or more major wrestling promotions. Cody Rhodes and the Young Bucks. Since the AEW’s launch in January 2019, it has already begun selling merchandise despite not putting on a wrestling event or announcing a television deal. With the Khan’s financial backing, the proven abilities of Rhodes and the Young Bucks, and their mastery of social media, they have also made their intentions clear that they aim to be in direct competition with the WWE. This has definitely added to the hype. 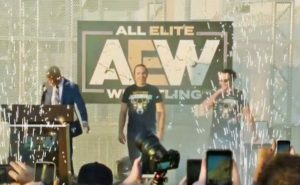 AEW supporters, egged on by the excitement started showing up at WWE events wearing ‘AEW’ t-shirts and having them confiscated by the security guards. 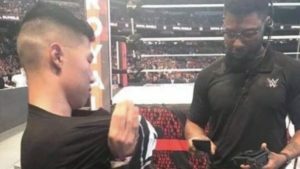 The most recent of these incidents were captured on video during the WWE’s Royal Rumble when a male fan in an AEW shirt was ordered by security to remove his shirt. The fan complied and was already wearing another shirt underneath. This causes speculation on whether the fan knew what he was doing but did it to be defiant and show his support to the new wrestling organisation. A fan at the Royal Rumble pay-per-view was forced to remove his All Elite Wrestling (AEW) apparel by WWE.The images and video of the fan removing his AEW t-shirt went viral and led to a response from the company's Executive Vice President, Nick Jackson of The Young Bucks.In case you didn't know…WWE has had a history of making fans change t-shirts at events for a variety of reasons, but only recently has the trend resurfaced.The company was rumoured to have barred people wearing AEW merchandise from entering the arena for a SmackDown Live show earlier this month before the videos and reports went viral and the fans were let back in.The heart of the matterThe fan was seated in the front row of the right aisle, a few feet away from the ring and was forced to remove his AEW shirt by WWE personnel.The video came from Twitter User "blackheart;kelsey" but went viral when a Twitter user "Scrump_1" posted to his account about 30 minutes into the show.The photo of the fan being forced to remove his AEW merch came from Twitter User JSRiley87 who responded to a tweet from Adam Pacitti of Cultaholic and hit the internet about 40 minutes into the show.Nick Jackson of The Young Bucks would respond to the video and say that AEW would never force a fan wearing a WWE shirt to remove it just because they were at an AEW event.Twitter erupted with tweets of fans admonishing WWE for forcing fans to change their attire, while others supported it and called it "a smart business decision" by the company looking to crush any perceived competition.The video shows that the fan had another shirt underneath his AEW merch, which could mean that he was prepared for the shirt to get removed or that he possibly changed into the shirt when he got in the arena.For More Information On News Of The World Subscribe To My Channel. I remember years ago while I was in high school, a group of friends and I decided to have a meal together after school. We wanted to eat from different fast food places, so I grabbed my meal from one restaurant while others got their food from another establishment, and we met up with rest of our group where they chose to eat from the most common fast food place. While we were sharing in our meal and enjoying the conversation, one of the staff members approached our table and asked if we could pack up our food and move elsewhere. After explaining their situation and policy to us, we were happy to move along and find another spot. As a teenager, I wasn’t mindful that the restaurant had a business to run, and it would’ve reflected badly on them if other customers walked in and saw that people weren’t eating their food. 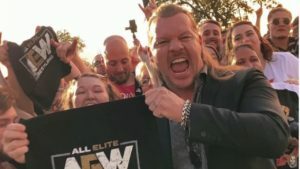 AEW wrestler, Chris Jericho posing with fans at the AEW rally. The AEW fans may not be as innocent. I’ve observed on social media instances where they show their support in a brash and cocky manner, feeding off the arrogant and self-worship vibe that Rhodes and the Bucks display as part of their characters. If you intend on going to a WWE event, then do so as a fan. Don’t be intrusive and go looking for a fight, as if you’re doing a service for the competitor, because you’re not! Competition is great and it’s wonderful when fans can show support for their favourite company. But supporting your favourite company at the expense of another shows poor behaviour. It is important that all fans when attending wrestling events to use some common sense in their approach to the show. The reality for the fans is that they are being sucked into the hype driven by Rhodes and the Bucks on social media in anticipation of AEW’s first event. However, this does not mean that they are expecting fans to be silly or indeed not use their own common sense when attending WWE shows. Sometimes taking a step back from the hype as a fan is advised even if Cody and the Young Bucks act like their own biggest marks.